Our Classical Homeschooling Curriculum for 2013-14: 2nd Grade and PreK/Kindergarten - The Kennedy Adventures! 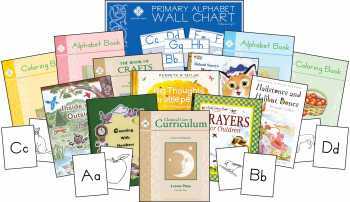 Ready to check out our classical homeschooling curriculum for this year? Grab your pencils and notebooks — I’m going to do a run-down. This year marks my third year as a homeschooling mother. I’ve learned a few things about what works for us, along with what doesn’t. I chose a boxed classical curriculum for a few reasons. Brett and I had explored private education briefly for our children, and loved the curriculum used at the Highlands Latin School here in Louisville. I need a plan and guideline, something to follow, so that I can mentally track our progress. The lesson plans help keep me on a path, and I add and subtract things as they work for us. This year, Rachel will be in the second grade, while the boys will be doing a combination of PreKindergarten and Kindergarten work. The boys will be following the same homeschool schedule as Rachel, with slightly shorter days. My focus for them will be phonics and math, while working on their fine motor skills and handwriting. Along with using MP’s Alphabet Books 1 and 2, I’m adding in All About Reading pre-reading program. My boys struggle with writing, and MP’s program is writing heavy. With the multi-sensory approach from All About Reading, I think my boys won’t get as frustrated. Math comes a little easier for my boys. I’m sticking to the lesson plans from Memoria. 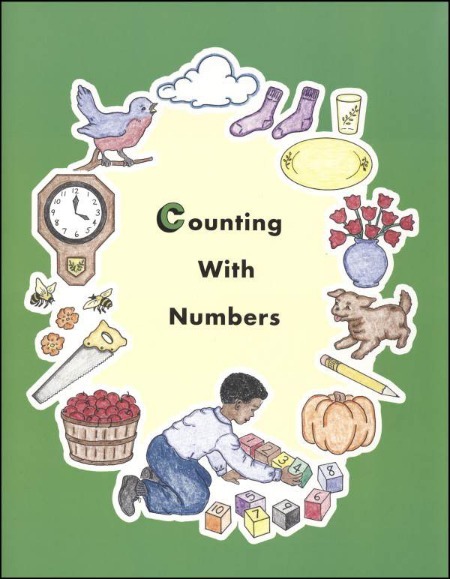 (see a sample here) We use the workbooks from Rod and Staff, along with the Numbers Coloring Book. I also add in some number games for fun. I’m shooting for doing these subjects with the boys one on one, while Rachel works on some of her subjects independently. It’s going to be a challenge to keep all of the balls in the air at the same time. When I pulled everything out of the box this year, I was thrilled, but a wee bit overwhelmed. Second grade has a LOT to cover. I won’t lie — I’m scared to death of teaching all of the littles, while running after a rambunctious toddler. Phew. Take a look at the sample lesson plan from MP for second grade – some of these things are easier for us than others. Rachel is a FANTASTIC reader, so phonics is a piece of cake for her. This will be an area, along with her reading, that will be independent for her. I’ll set her up and get her started, while I work with the boys one on one. Spelling was a challenge for us last year – I’ll need to focus more than last year. I love the approach that MP takes in tying phonics and spelling together. I noticed that the spelling words are directly related to the phonics section of the week. The vocabulary words come directly from the novels Rachel will be reading. Memoria Press speaks to my heart with their beautiful literature selections – we’re excited to be reading some great novels this year in second grade. On Rachel’s list? Mr Popper’s Penguins, The Courage of Sarah Noble, Little House in the Big Woods, and Tales from Beatrix Potter. MP creates amazing Student Study Guides to correspond with each novel, where students work on vocabulary, reading comprehension, literary elements and more. These are some of my favorite MP resources. Math can be a bone of contention for Rachel and myself. Rachel does OK in math, but I don’t think she’s retaining facts as well as she should. I’m going to take a slower approach this year, and add some math games on the iPad for her to practice. Memoria uses Rod and Staff, which is a slow, methodical system with lots of review. It’s not for everyone, but works well in my house. Cursive writing is a subject that we started last year, but fell off toward the end of the school year. 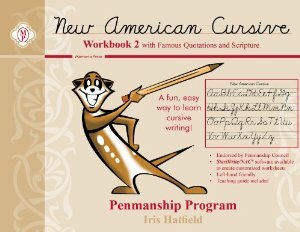 I plan to finish the first grade cursive program from New American Cursive, then pick back up according to schedule with level 2. Are you ready for this? We’re going to study Latin this year! I was considering avoiding Latin like the plague, until I heard Paul Schaeffer speak this summer. He reminded us that not only does Latin tie in to other disciplines (mathematics, medicine, law), but it is the language of our Catholic Church. Rachel will be working through Prima Latina with her father this year. I’ve read through the teacher guide and even watched the first lesson on DVD. It’s laid out systematically and logically – I’m anxious to see how Rachel takes to it. 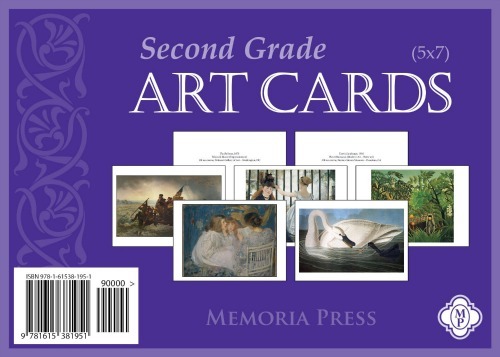 Something new in the MP resources this year is Art Cards – I’m thrilled to be able to add this for Rachel. Each week, we will take a peep at a famous piece of artwork (usually tied in with a literature selection that we’re reading). If we have time, we’ll investigate the artist a bit. My friend Tricia over at Hodgepodge has an amazing art resource that I’m planning to explore as well. Along with her talented mother, she’s created Chalk Pastels:Art for All Ages. I’m aiming for my oldest daughter Abigail to come over and work through these art tutorials with Rachel. Memoria Press does a wonderful job of tying in science and social studies to the literature selections of the week. If you take a peep at the lesson plan, there’s a read-aloud each week. The suggested science and social studies all tie in to the book that we’re reading as a family. Brilliant! I gather the children together for certain subjects, and we work on things as a group. We generally start out the day with circle time, where we check the calendar, look at the weather, and say our prayers. As a family, we talk about virtues and our faith. I read a selection from Little Acts of Grace, and we talk about how to behave in church, why we kneel, and where we can find the tabernacle. My children also enjoy having fun with the We Choose Virtues characters. This program can be used in a home, traditional school or even a church program, to help children understand virtues like patience and obedience on their level. We’ll do the read-alouds together as a family. Rachel usually helps me out by reading the PreKindergarten read-aloud to the boys, then I’ll usually read the second grade selection to all the children in the afternoon, or at bedtime story time. We’re doing our religious education at home with Rachel this year as well. Our parish uses the Blest Are We series, and I add more studies of saints, reading from our Catholic children’s resources. While Memoria Press has a layout for studying music, we took a different approach and chose Making Music Praying Twice. This system is based on the liturgical seasons of our Catholic Church, including both children’s music and traditional hymns. In the boys’ PreKindergarten program, we have a Book of Crafts. Since Rachel enjoys crafts, she’ll join in, too. Depending on the complexity, we might explore Chalk Pastels as a group. 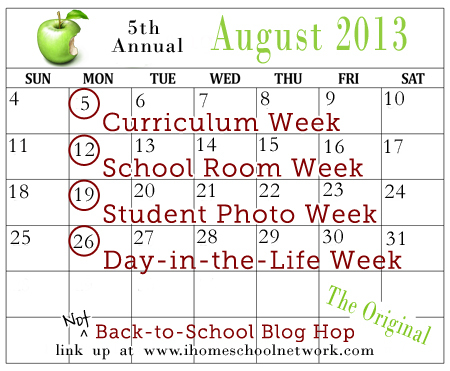 This post is part of a giant linkup over at iHomeschool Network, where hundreds of homeschool families are sharing their curriculum choices for the year. Head over and check it out — don’t miss the following weeks where you’ll meet the students, check out the classrooms, and see a typical day in a homeschool family’s life. I really love the selections from Memoria Press. We are using the art cards for the first time this year too. I’m excited to see how the kids like them. Looks like a great year! The art cards are beautiful! I need to laminate them, or perhaps slide them into a photo album to protect them. I thought that I “saw” you on the Memoria Press forum! I love how helpful they are also – they gave me great advice on grouping my two Latin students together. I’m ready to see how I’ll balance 5th, 3rd, K and PreK! So glad to see someone blog MP materials, not many people do. We also do MMPT and my three year old loves it, but we are also going through the MP kinder music suggestions as a family. Great post! Don’t ya just LOVE MMPT? Awesome! Part of what I love so much is that it is real music, not synthesized. We’ll end up doing the Junior K music too — my kids can’t get enough, and the baby will love it. I love those Rod & Staff books. We’ll be doing those this year, too. And We Choose Virtues! The R&S books are so peaceful — does that sound crazy? We just love them. I’ve looked at the Memoria Press curriculum a number of times and sometimes wish I used a box set for the same reasons you stated, but I think I’m a bit of a control freak and like to hold on to planning just what I want =) I’m happy to read your thoughts about it, though! Thanks for sharing it with us at Trivium Tuesdays! It’s funny, as my kids get older, I’m more comfortable with customizing the boxed curriculum for my family. Like we discussed, I change out the Bible for our Catholic version, and we add in a Catholic music program. Are you as excited as I am? We loved Jr K last year and we’re two weeks into K and it’s perfect. Everything is just the slight bit of challenge that she needs. Oooph — it’s hard for me to be excited when I’m not feeling well! We’re easing back into school very very slowly. I love both Jr K and K. I’m hoping that my boys take to school better this year than last, and we’ll end up doing K sometime at the mid year point. If you chatted with them, they may have plans to add on 7th grade next year. If I recall correctly, they’ve been adding on the total curriculum packages slowly. Something else you may want to take a peep at — they have online courses as well. We MIGHT utilize the cottage school option next year for a class for Rachel. Would you mind sharing your thought behind picking the Latin program that you did (instead of Memoria Press or others)? I’m interested in learning Latin myself (an adult), primarily for Catholic prayers and Mass. I’m am looking for any advice that may be helpful! Many thanks. Hello, Marta! Prima Latina is a Memoria Press product. Having absolutely no Latin background myself (except what I’ve learned by being a nurse), I needed something SIMPLE. I followed the recommendation from the folks at MP, and Prima Latina is their intro level Latin. I’ve looked through it all, and it’s gorgeous. It’s laid out sensibly, has video lessons as well, and I think it’s going to be easy to teach. I’m actually going to be doing some in-depth reviews of the Prima Latina curriculum, as well as other aspects of the MP package. Stay tuned, and you’ll be able to see exactly how we use it. I’m going to be shooting videos and the whole nine yards! My son is in 4th and we are just starting Christiana Latina 1. I made the mistake of not ordering the DVD’s. We are now on hold with Latin until they come in. Last year we did Latin, but only flash cards. I love these Curriculum Posts. I am already thinking about next year. I hope this was helpful for you, Emily. I think the DVDs really help me be able to teach the program. Thanks for the information! My oldest is three yrs and three months…she’s seems very advanced but we haven’t officially started any schooling. Would the Junior K program be for her age level of 3-4 or is it better suited for 4-5 year olds? It’s hard to say. If you head over to Memoriapress.com and click on the forum, you can poke around in there and ask the folks there. It’s comprised of parents and Memoria Press staff members — they are great at helping out where you should start.